We’ve compiled some of the coolest apps for both Android and Apple iPhone users, that enable your phone to transform into a functional piece of gear in the backcountry. Here are a few of our top apps that help you get the most out of your smartphone. 1) Trace Tracker: (Pictured above; FREE app; $199 for Trace Tracker) It’s the size of a Reese’s peanut butter cup, can be mounted on your board, helmet, or skis, and is jam-packed with 2GB of memory and durable as hell. Trace measures speed, vertical travel, lift time, ride time, air time, jump height, air height and calories burned. Not only does it come in at a super-low weight, it can also sync with your GoPro with Trace Video (a Mac desktop app) and the program will meld the daily stats with your highlights, for an awesome video that’s auto corrected for the best color. It’s like your own personal film crew during each ride. Extra bonus: It’s made for surfing as well! 2) Avanet: (FREE for iOS) This newly released app (based off the current web platform and SP1 probe developed by Avatech) shares mountain safety information to help you plan safer trips into the backcountry. The app allows users to share reports of avalanche conditions, wind, temperature, routes and snowpack conditions. In addition, it provides red flag analytics, real-time observations, terrain visualization, and the ability to upload photo, video and voice. 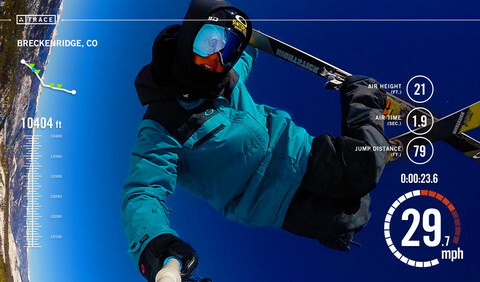 The app was made for skiers and boarders alike, and provides notes or insights into avalanche professional’s reports. For the backcountry enthusiast, the app acts a checklist for you to make the best decisions when travelling through the wilderness. Reviews are out, and this app is a win! 3) RageLife: (FREE for iOS) Another new kid on the block, RageLife helps provide the easiest way to the mountain by finding others that are going in the same direction! Texting your list of friends for carpooling to your next adventure won’t be an issue! It’s quite simple- you connect this app with your Facebook, and based on your location, you can connect with other local like-minded users. You can also create an event and search for events as well. So my suggestion would be to jump on this bandwagon fast! 4) SAS Survival Guide: ($5.99 on iOS or Android) Based off the SAS Survival Book, the app is one you may want to have, and hope you never have to use. The app provides over 400 pages of survival and preparation techniques such as building fires or shelter, and helping you identify plants that are edible (and the ones that will send you to the ER). It categorizes in nine chapters and one of the chapters includes Urban Survival which provides essential survival strategies for terrorist attacks or power outages. 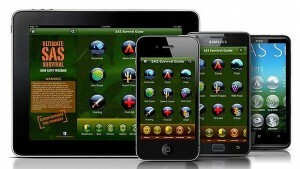 The app also provides a comprehensive first-aid section, quizzes, Morse Code and compasses. 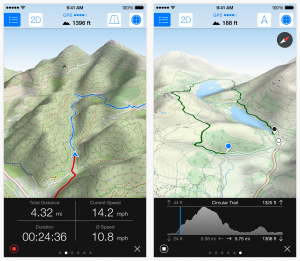 5) Maps 3D Pro: ($2.99 for iOS) The ultra-cool maps app provides endless searchable and routable maps for your outdoor lifestyle. It’s a runner’s, hiker’s, biker’s (and even horseback rider’s) go-to app for exploring the great-outdoors, whereas other map apps are primarily for city or roads. You can plan, record, waypoint and share your routes, as well as store maps for use offline. The best part is, it’s viewable in 3D so you can literally see the elevation gain (or loss) you still have to go. It brings the valleys and mountains to life, and is brilliant. PLUS, for a limited time only, it’s 40% off! Run, don’t walk. 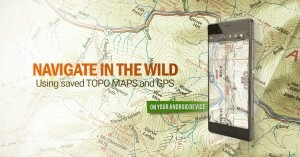 6) Backcountry Navigator PRO GPS: (FREE and $11.99 for Android) For the Android lover, the Backcountry Navigator GPS would be my top pick for outdoor topo maps, which you can download for offline use while in the backcountry. It’s great for hunters, snow sports, fisherman, whitewater, equestrian and hikers! YES, you read correct. Marine charts are included! It’s been a best-selling app for years on the Google Play store, but if you haven’t seen this in action, now is the time! Demo it for free and you’ll soon just buy the full version that unlocks even more features. 7) Waze: (FREE) Traffic heading to your adventure is a drag, but Waze uses real-time updates and navigation to keep you in the fast lane. Updates include traffic, accidents, closed roads, and speed traps. When using for navigation, the app will automatically update you on status and when you detour to another location. Since its community based, you can also connect with users for carpooling, to save out-of-pocket expense. And a really cool feature is when all your friends connect Waze to Facebook, you can track to see where your friends are in-route to your meeting point. I can’t resist the mini-ghost icon. 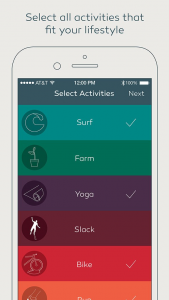 8) Outdoorsy: (FREE for iOS) The perfect way to sum up this app? “Gone are the days of struggling to find someone to join you outside.” The iOS app connects you to events/meet-ups around your area and allows you to meet new friends (and invite old ones) on your next climbing trip, or other outdoor adventure. You can also create your own event and share via social media as well. And you can take this anywhere with you since it’s currently available worldwide. The more the merrier, right? Jump on Outdoorsy to get the party started. 9) SkiLynx:($2.99) The brand-spanking new app just launched this week, and already I can’t wait for it to come to CO…sad face. Yes, you heard right. As of right now the app (available for iOS) is available at ten California resorts, including Squaw, Alpine Meadows, Kirkwood, Mammoth, Northstar, Heavenly, and Sugar Bowl. It will debut in the Rockies later this winter, and according to the website the plan is to eventually expand across North America and Europe. 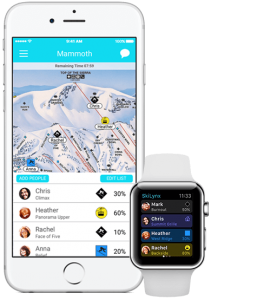 That being said, the GPS-enabled software will link up with the resort’s trail map so you can see exactly where you and your friends are in real time on the mountain. As long as all of you have the app, you can see them (and you). In addition, you can filter who you see, what percentage of the run you have completed, track your total miles skied, and it offers lift statuses and weather info. Incredibly enough, it can send pre-set messages for meet up points with a tap of a button. Pretty slick and coming soon to the Rockies. 10) GoPRO: (FREE) Not necessarily new, however, now anybody with a Wi-Fi enabled GoPro (the ones that can sync to iOS or Android phones like the Hero4) can grab footage directly from the camera to a phone, then select the scissor icon to make simple cuts and create a basic highlight real. Users can then upload the clip to any social platform, including Instagram and Facebook. The app update can also select still image clips as well which is a beautiful thing. In addition to the easy-upload function, the update is now compatible for your tech-savvy folks with Apple Watches. Functions from your watch include previewing your photos, controlling your camera and tagging your best shots. Christmas is a part of the Subaru Adventure Team, an organization dedicated to exploring, finding new adventures, and inspiring others to do the same. Christmas and her fiancee, Randy, travel the world and share their stories along the way. You can find weekly adventures with them on their social media pages at www.facebook.com/TrueSubaruCouple or on Instagram as @TrueSubaruCouple.